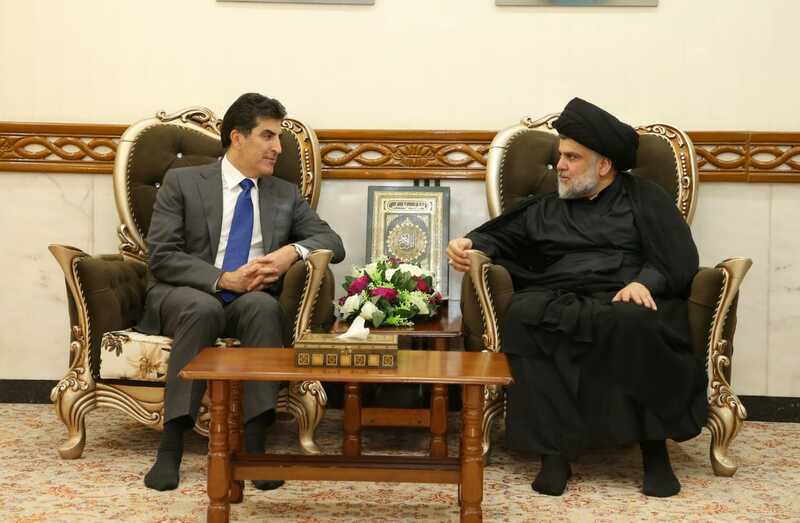 In Baghdad, Prime Minister Barzani separately met Iraqi Prime Minister Mr. Haider al-Abadi, the head of Iraqi National Wisdom Movement, Al-Hikma, Mr. Ammar al-Hakim, the Vice-President of the Republic of Iraq, Mr. Nouri al-Maliki, the leader of Al-Bina Coalition, Mr. Falih al-Fayyadh, the head of the Fatih List, Mr. Hadi al-Amiri, the Head of the National list, Al-Wataniya, Mr. Ayad Allawi, and the leader of Al-Sadr Current, Sayyied Muqtada Al-Sadr in Najaf. Prime Minister Barzani discussed with Iraqi leaders the political process in Iraq, including the election of the new President and Prime Minister of Iraq and the formation of the new government. They stressed that the next Iraqi government should be a government that would work to meet the demands of the citizens, provide security and job opportunities and actively contribute to the reconstruction of the country. They also hoped that the outstanding issues between the Kurdistan Region and Iraqi federal government will be settled through the new Iraqi parliament and government within the framework of the full implementation of the Iraqi Constitution.